A high quality double chain giraffe unicycle from Nimbus. With its CrMO frame, safety sprockets and the double chain this giraffe is ideal for performance use. A big step-up (pun intended!) from the single chain giraffes on the market. Transmission: twin extra-strong chain using large sprockets. Wheel: 20" wheel with aluminium hub fitted with twin UDC safety sprockets and double -walled aluminium rim. Tyre: large 20x1.95" BMX tyre, Schrader valve. Pedals: large platform plastic pedals 9/162 thread. Frame: extra strong CrMo frame with chromed finish. (Most giraffes are made of steel but CrMo is much stronger) Seatpost: 400mm long, 25.4mm diameter anti-twist knurled seatpost with alloy quick-release seat clamp. Seat: black Nimbus Gel saddle for more comfort with front handle and rear protective bumper. Care must be taken when dismounting from giraffe unicycles not to drop them hard as this can sometimes bend the frame. 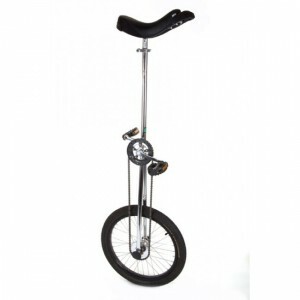 Recommended leg lengths for unicycle: standard seatpost: minimum 68 cm (26.8 "), maximum 102cm (40.2") these sizes are measured from crotch to floor wearing shoes.